This Performance Note describes a rare measurement lock-up issue that impacts the Medtronic dual chamber pacemakers listed above. If this measurement lock-up occurs, the device will trigger a false Elective Replacement Indicator (ERI). A reset is available to clear this condition and there is no need to explant the device. This issue does not impact battery longevity. 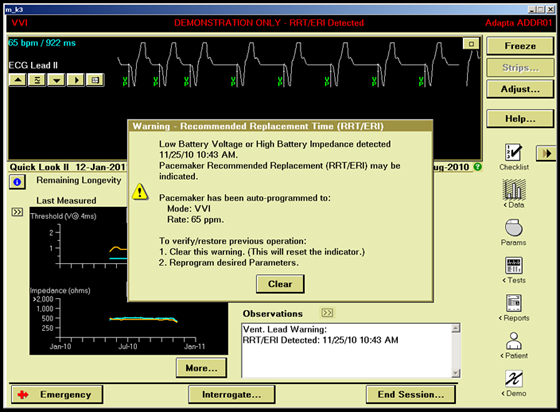 If this rare measurement lock-up occurs in the pacemaker, it causes the device to read a value of zero for battery voltage. 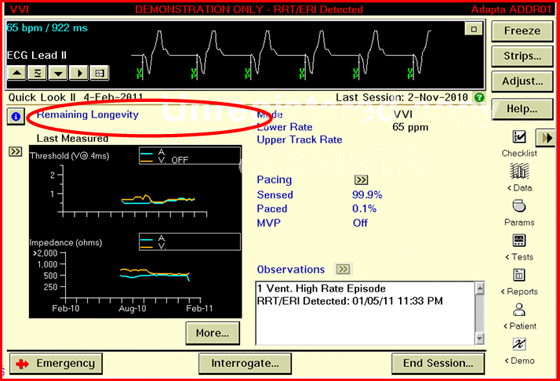 After four measurements of zero, the device will trigger ERI and revert to a VVI pacing mode at 65 bpm. There is no loss of ventricular pacing and the output voltage will remain the same. Programmer software is available which can differentiate a regular ERI and an ERI caused by the measurement lock-up issue. 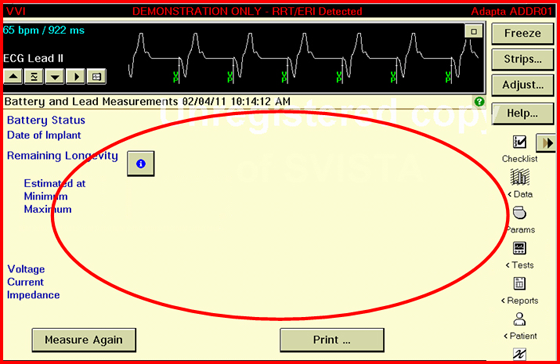 Upon interrogation of a device with the measurement lock-up ERI, the programmer software recognizes the issue and guides the clinician to clear the ERI (Example 1). Following an ERI reset, the device parameters should be reviewed and reprogrammed to clinician specifications. A service tool continues to be available through Medtronic Technical Services to clear the measurement lock-up issue for Kappa and EnPulse devices. The issue can be identified using the programmer or via CareLink transmission; the battery voltage measurements and remaining longevity will appear as blank values (Example 2). If this measurement lock-up occurs, contact Medtronic Brady Technical Services at 1-800-505-4636 for assistance.